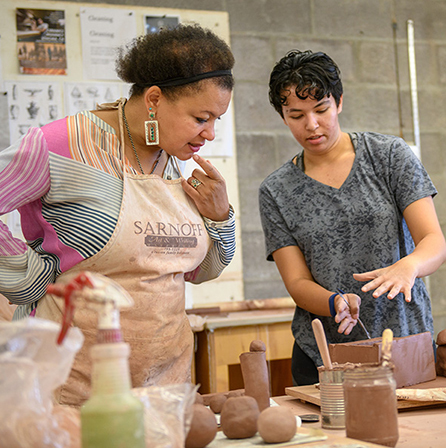 Fine arts professor Io Palmer has been teaching ceramics, sculpture and other arts courses at WSU since 2007. Mixed-media sculptor and WSU associate professor of fine arts Io Palmer uses her artistic skills to explore complex social issues and her teaching skills to inspire future artists. Inaugural recipient of the Berry Family Distinguished Professorship in Liberal Arts at WSU, Palmer recently received a Fulbright-Nehru Academic and Professional Excellence Award and is preparing to deploy her diverse skills in new ways in a new environment. In January, she will travel to India for six months to advance her multimedia work titled “Created, Consumed and Scrubbed,” an investigation of the way fabrics in India are made, cared for, bought and sold. In addition to conducting research for the project, she will serve as a resident artist at the Sanskriti Foundation in New Delhi. While on the subcontinent, she will interact with artisans and laborers in the production of fabric for clothes and other products. She will examine the art, economics and labor issues behind a burgeoning segment of the global fashion and home décor arena. “By studying the fabrics of India, I hope to better understand this rich and diverse society,” Palmer said. She plans to create a series of videos and drawings based on her experiences abroad. The hands-on research will greatly inform her future artwork and teaching, she said. Palmer, left, shows one of her students the best way to prepare clay for molding. The combined financial support from Palmer’s Fulbright grant and her three-year Berry professorship will enable her to create more deeply within three current focus areas on three distinct, long-term projects, she said. 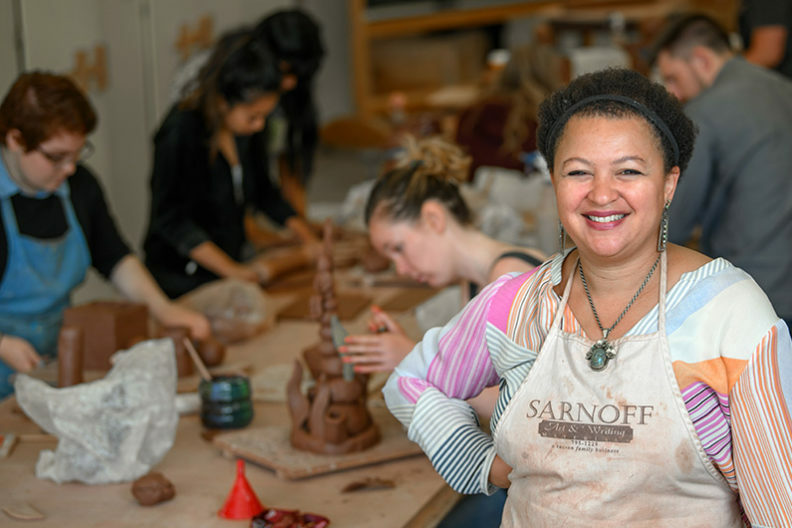 Her third big project to get a boost — called “In Ceramics In Science” — brings together fine arts students at WSU Pullman and medical students at WSU Spokane to create public art reflecting the role of ceramic materials across healthcare. From X-ray tubes and dental bridges to surgical implants and prosthetics, numerous everyday medical devices and tools contain ceramic components. Trained originally as a ceramicist, Palmer regularly teaches art foundations, performance, ceramics and sculpture at WSU. For fall semester program on the Pullman campus, she is leading a newly designed Introduction to Art course which looks at the intersection of contemporary art and sports in modern society. A member of WSU faculty since 2007, Palmer has completed artist residencies across the U.S. and Asia, including at the Kathmandu Contemporary Art Center in Nepal, the Sanskriti Foundation in New Delhi and the Art Channel Artist Residency in Beijing. Her largescale works often employ a variety of materials and processes — from fabric and steel to video and sound — to explore issues of race, class, capitalism and societal excess. An example of her work examining selfishness and excess is now on display in the Jordan Schnitzer Museum of Art at WSU Pullman. Read more about Io Palmer on the College of Arts and Sciences website. See samples of Palmer’s work on her website.